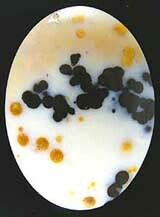 Polka Dot Agate has nice transluscent background with contrasting golden, brown and black polka dots. Polka Dot Agate is what is referred to as a jasp-agate and is often called, not incorrectly, Polka Dot Jasper. 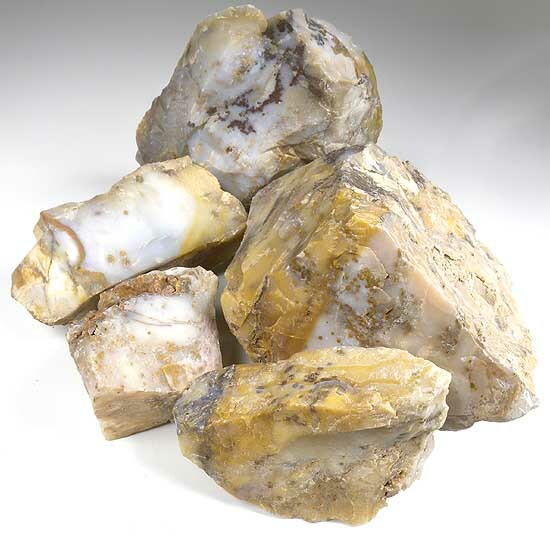 Polka Dot Agate has never been available in large quantities. We selected this material 15 years ago. Polka Dot Agate takes a great polish. As with all of the other species in the quartz family, polishes best with cerium oxide, but also takes a fine polish with tin oxide and diamond. Mohs hardness 7. Sample of Polka Dot Agate Rough. Measures approximately 5" x 5" x 5" at the thickest point. Nice Slabber! Triangular shpae measures approximately 6-1/2" x 3-1/2" x 3-3/4" thick at a peak. Triangular shape measures approximately 5-1/4" x 3" x 2" at the thickest point. Triangular shape measures approximately 4-1/2" x 3" x 2-3/8" at the thickest point. Triangular shape measures approximately 6" x 5-1/2" x 3" at the thickest point. Nice pattern with a high concentration of dots! Measures approximately 5-1/2" x 4" x 2-1/4 to 1/2" thick. Polka dots on a base that ranges from clear translucent, to white and cream with nice striations! Three triangular shaped pieces measuring approximately 3" x 3" x 1-3/4" at peak, 3-1/2 x 2 x 1-3/4 to 5/8" thick. and 2-1/2 x 2 x 1-1/4" at peak. High concentration of polka dot on a contrasting white base!